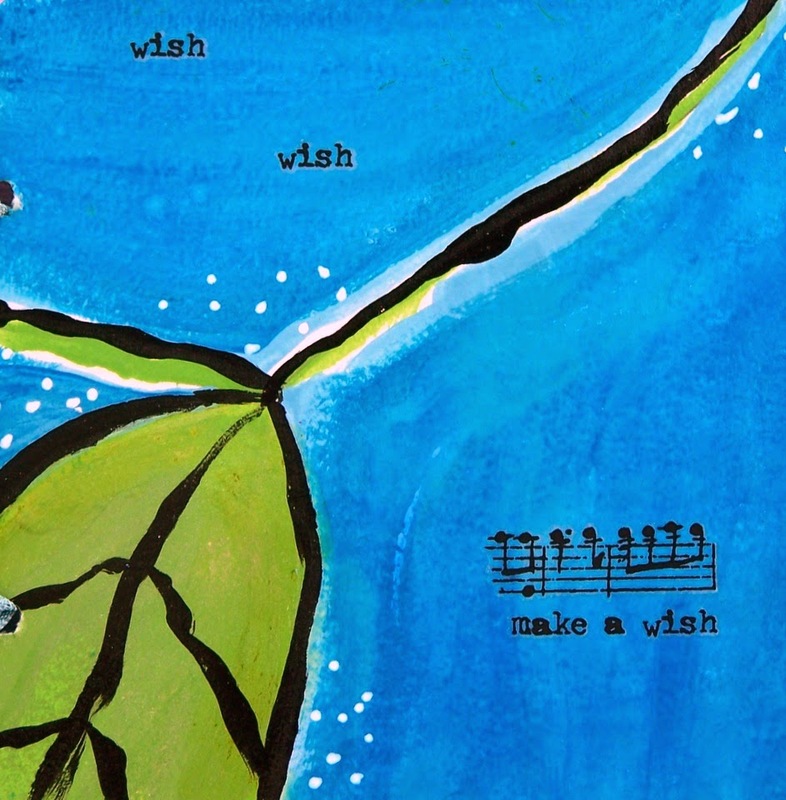 Eclectic Paperie: Birthday Triptych with Stencils and Paints and so much more! Birthday Triptych with Stencils and Paints and so much more! 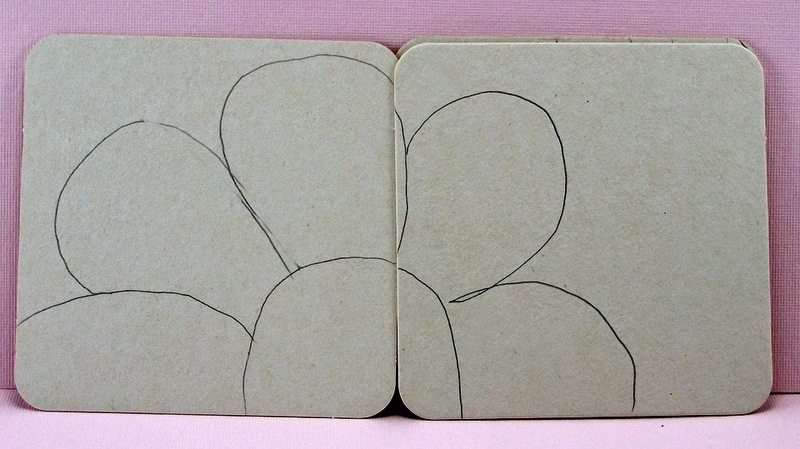 This is the inside with all three coasters open. 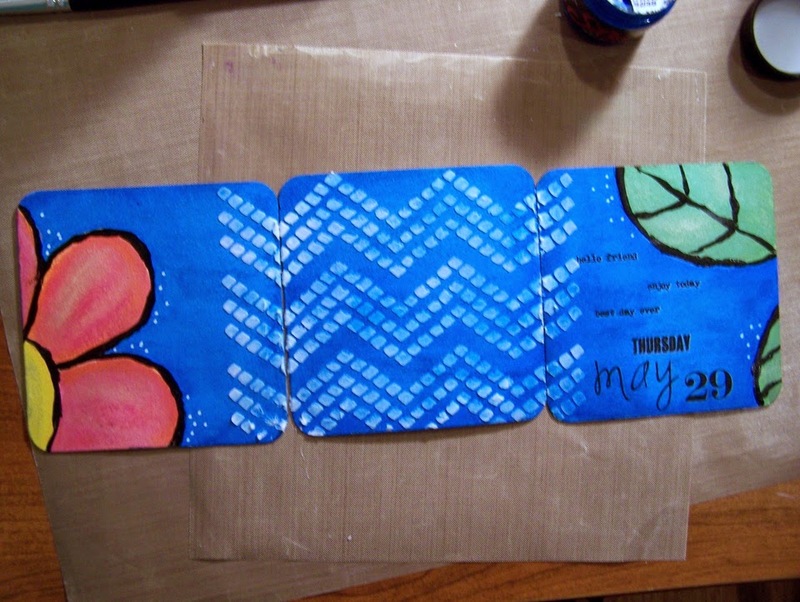 This is the triptych all folded up and how I will put it in the envelope. 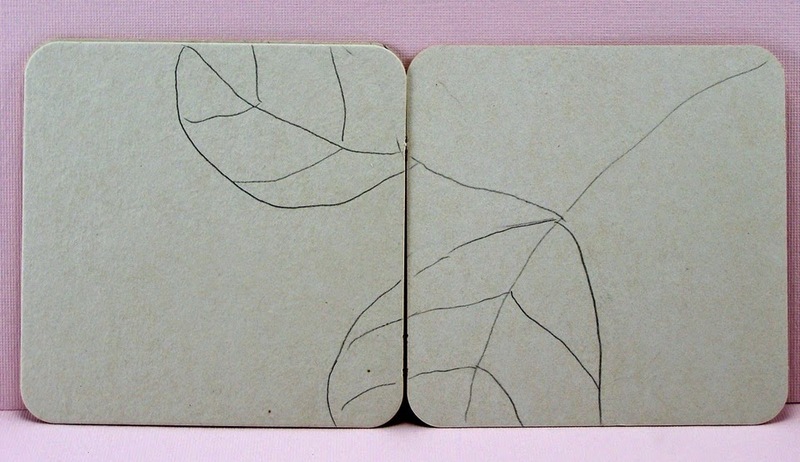 Left side closed - I made the leaves match the inside third coaster. Left side open, right side closed - again I made the flower match. I used more remnant rubs on the front cover - hello friend, enjoy today, best day ever, and her birthdate. 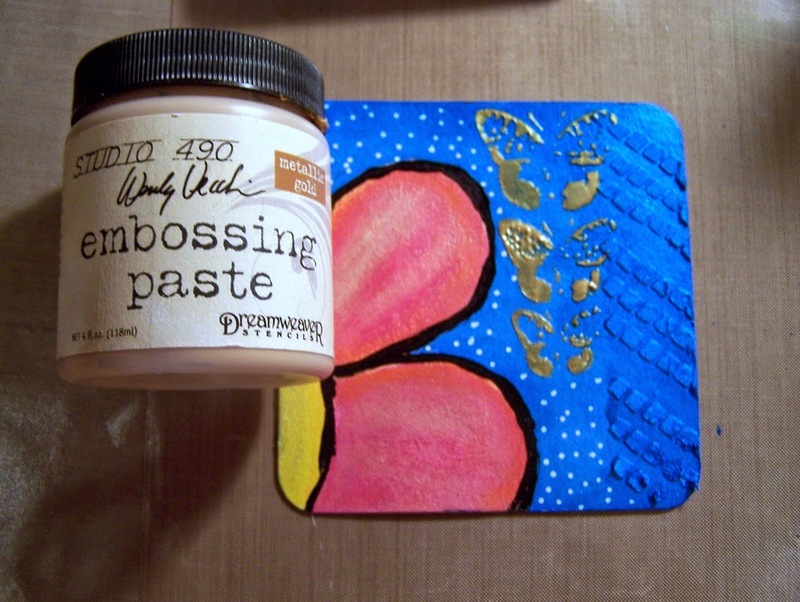 You can also see the TCW Mini Specimen stencil with Wendy Vecchi's Studio 490 metallic gold embossing paste - LOVE! and the TCW Chevron Tile Stencil I applied WV Studio 490 white embossing paste through and painted with Silks Acryllic Glaze Sky Blue. I wanted it to look like book binding. I made holes and tied it all together with seam binding that matched the inside art. As much as I hated to because I hate my handwriting, I signed it for my friend with a Fude Ball Black pen. I free hand drew a flower and leaves with a pencil. I am no artist! But this shows that YOU, too, can do this! I went back in and erased the lines I didn't want. NOTE: These lines are just a guide and don't have to be perfect. I closed the left coaster so I could match the leaves. I closed the left coaster and matched the flower. 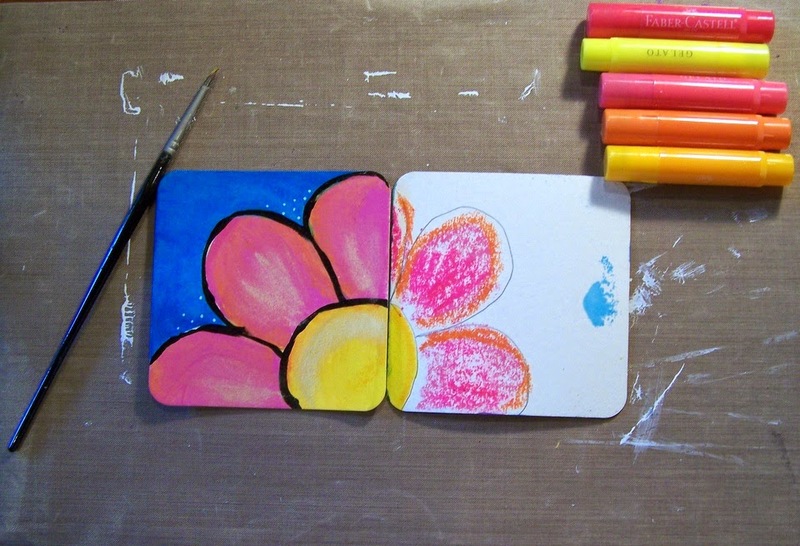 I painted the left with Tim Holtz Distress Paints, ( I own ALL of the colors! ), Silks Acryllic Glazes, and added Inka-Gold for shine. Everything was outlined with Adirondack Pitch Black paint. On the right, I played with Gelatos just to see what they looked like on the coaster. This shows how I scribbled the gelatos on and what happened when I added water with a wet brush. 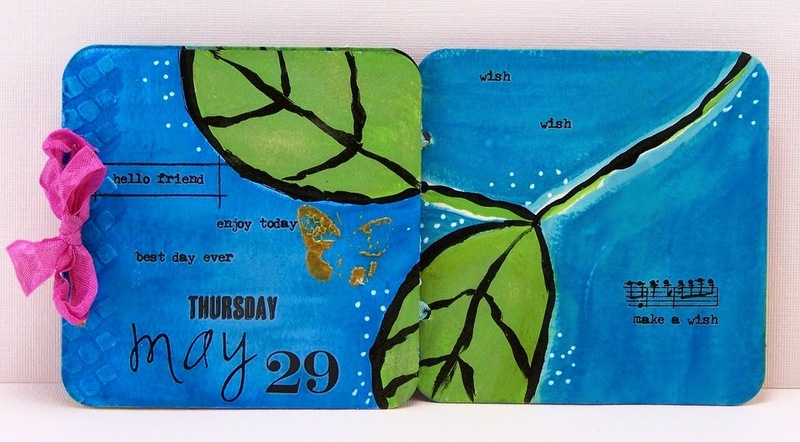 Here I painted the leaves and BG with Tim Holtz Distress paint and then went over it with Silks Acryllic Glaze for a Beautiful shine! This shows the TCW Chevron Stencil with WV white embossing paste. 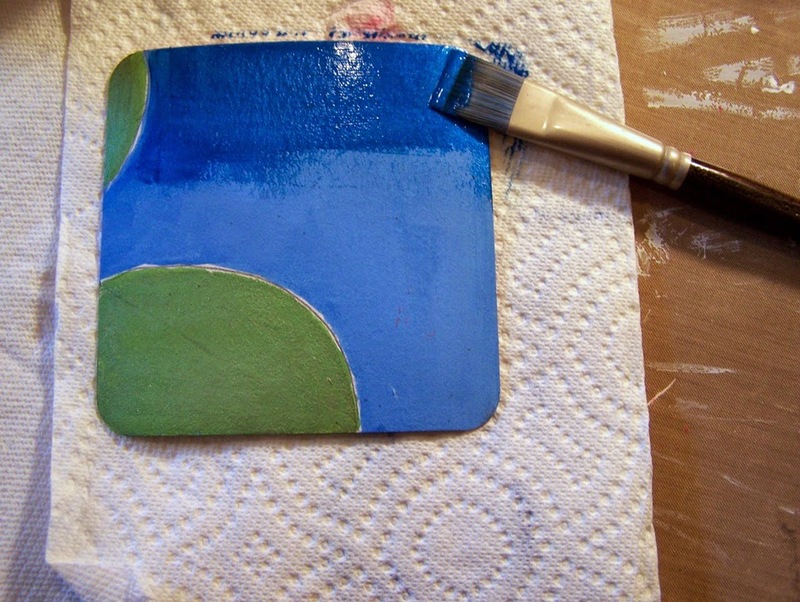 When it dried, I went over it with Sky Blue Silks Acryllic Glaze. In this last photo, you can see the butterflies and how pretty the specimens look in gold! Well that's it! I hope you like it! My friend is going to swoon because she will KNOW how much time and Love I put into this triptych for her! Sure beats my usual Birthday Card! Also, DON'T FORGET! There is still time to link YOUR beautiful creation using stencils to our eclectic Paperie ePlay Stencil Challenge! It ends May 31st and YOU could win a shopping voucher to the eP Shop! Come Play with us! This is just AWESOME Sue! 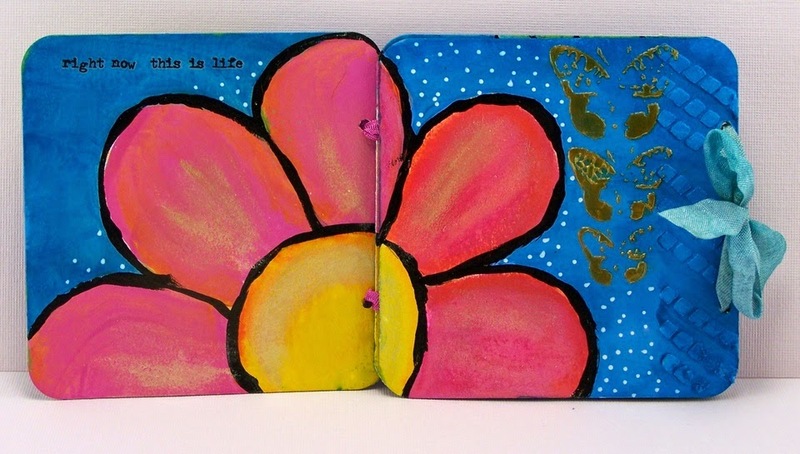 love the bright colors and your wonderful drawings of bloom and leaf - what a delightful triptych card for your friend! this will be lovingly displayed I'm sure!! FABULOUS, Sue!!! So vibrant in color and creative! I LOVE it! Thanks so much for the inspiration! Your friend will treasure this triptych card! Oh what an awesome way to use chipboard coasters. Love the bright colors. Sue your birthday card is just fabolous. I'm sure your friend will appreciate and treasure it. I love it and love your step by step tutorial. You made a great job and achieved a gorgeous result. 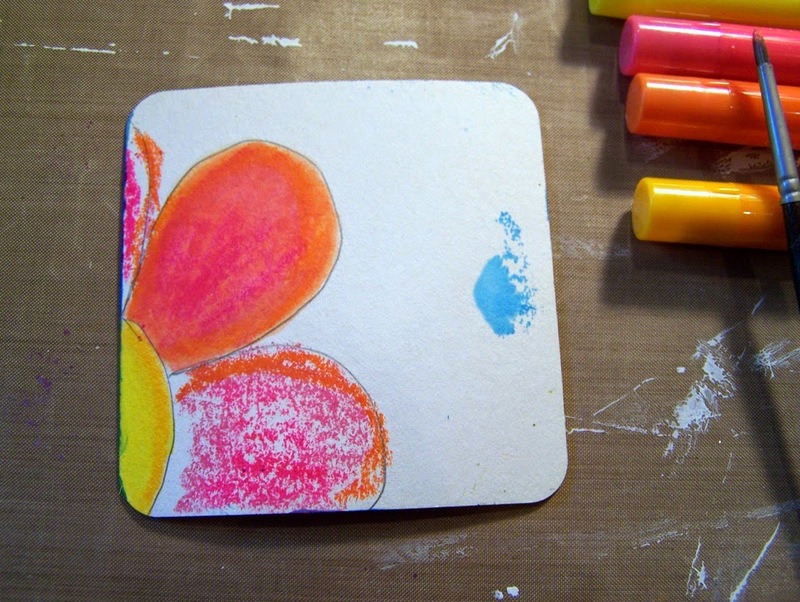 I'm so happy that you shared this for inspiration of what coasters also can be used for !!! LOVE the brightness of your card! And your flower ROCKS!!!! !